We’d love your help. Let us know what’s wrong with this preview of Sharing the Bread by Pat Zietlow Miller. Celebrate food and family with this heartwarming Thanksgiving picture book. We will share the risen bread. / Our made-with-love Thanksgiving spread. / Grateful to be warm and fed. / We will share the bread. In this spirited ode to the holiday, set at the turn of the twentieth century, a large family works together to make their special meal. Mama prepares the turkey, Daddy Celebrate food and family with this heartwarming Thanksgiving picture book. We will share the risen bread. / Our made-with-love Thanksgiving spread. / Grateful to be warm and fed. / We will share the bread. In this spirited ode to the holiday, set at the turn of the twentieth century, a large family works together to make their special meal. Mama prepares the turkey, Daddy tends the fire, Sister kneads, and Brother bastes. Everyone—from Grandma and Grandpa to the littlest baby—has a special job to do. Told in spare, rhythmic verse and lively illustrations, Sharing the Bread is a perfect read-aloud to celebrate the Thanksgiving tradition. To ask other readers questions about Sharing the Bread, please sign up. The art is warm and cozy with warm earth colors. You can almost smell the food. It is also warm in the sense that the story is about a family that is very close and working together for the Thanksgiving meal. Everyone is contributing. It's a nice warm rhyming story about the importance of family at Thanksgiving. It has an old fashioned style and cloths - with old fashioned kitchen-ware too. Sharing the Bread by Pat Zietlow Miller and Jill McElmurry shares an old-fashion Thanksgiving story of a family working together to prepare for the feast. Delightfully illustrated it shows a classic 19th century American family at Thanksgiving. Everyone in the family participates in preparing for the big event. The children make festive placemats and grandma bakes the pies. The text is simple and geared for those four to eight years of age. The colorful illustrations combined with catchy sentenc Sharing the Bread by Pat Zietlow Miller and Jill McElmurry shares an old-fashion Thanksgiving story of a family working together to prepare for the feast. Delightfully illustrated it shows a classic 19th century American family at Thanksgiving. Everyone in the family participates in preparing for the big event. The children make festive placemats and grandma bakes the pies. The text is simple and geared for those four to eight years of age. The colorful illustrations combined with catchy sentences make it easy to read to children of all ages. It's the perfect book to bring to your next Thanksgiving celebration. It shares working together, celebrating and family. I loved that each person no matter how small had an important job to do. First of all... I LOVE the holidays so when I was given the opportunity to review Sharing The Bread then I immediately accepted. Sharing The Bread is a beautiful description of the meaning behind Thanksgiving. It has simple yet beautiful illustrations that will appeal to not only the young audience but everyone. Sharing The Bread expresses how to have the whole family involved in the process and traditions that go along with Thanksgiving. Each member of the family has their own job and they all First of all... I LOVE the holidays so when I was given the opportunity to review Sharing The Bread then I immediately accepted. Sharing The Bread is a beautiful description of the meaning behind Thanksgiving. It has simple yet beautiful illustrations that will appeal to not only the young audience but everyone. Sharing The Bread expresses how to have the whole family involved in the process and traditions that go along with Thanksgiving. Each member of the family has their own job and they all work together to bring Thanksgiving to the family. "Food and loved ones. We are blessed." All together on this day." I love to check out the new holiday picture book offerings - especially Thanksgiving, which has become so over-shadowed by Christmas and Black Friday! So it was fun to peek at this new picture book today. Sharing the Bread is set in the late 19th century, is simple and sweet, with lovely rhyming, rhythmic verses. Everyone in the family has a job to do in preparation for the meal. The only religious overtones are at the end when the double-page spread depicts the entire family holding hands arou I love to check out the new holiday picture book offerings - especially Thanksgiving, which has become so over-shadowed by Christmas and Black Friday! So it was fun to peek at this new picture book today. I liked the rhyming text that describes how the members of a family (probably late 1800s) prepare for Thanksgiving. All done in rhyme, the story flows easily. All about the family effort to get Thanksgiving food on the table. Darling! Really enjoyed this rhyming portrayal of a family coming together to prepare and enjoy a Thanksgiving meal. Wonderful pictures too. Your next traditional Thanksgiving picture book. Reminiscent of Ox-Cart Man. A fun one to read aloud because of the rhyming. It shows the family preparing Thanksgiving dinner. This review has been hidden because it contains spoilers. To view it, click here. I expected a cute old-fashioned, simple story of Thanksgiving with this book. On the first page I knew I wouldn’t like the writing. I really don’t like repetition. “Mama, fetch the cooking pot. On the second page I realized the first two lines ended with the same word, the third one ended with a word that rhymed, and the last one ended with the same word used in the first two lines. ‘Daddy, make the fire hot. Tend it so I expected a cute old-fashioned, simple story of Thanksgiving with this book. Tend it so it’s blazing hot. Ready for the cooking pot. The line ‘Daddy make it hot’ was a bit uncomfortable to read. As I read along, with this kid just telling everyone what to do, he just came across as bossy and annoying to me. Telling everyone do this, do that. Based on the cover, it looked like there was only the mom, dad, boy, and girl. Suddenly there was a brother. Then there’s grandparents. As if that wasn’t enough, there’s more characters, more people for the boy to boss around. He was just a pest to me. An aunt comes into the picture, an uncle. ‘Brother, baste the turkey well. It just doesn’t make for good reading. Also, another line was annoying and not pleasant to read. ‘Grandpa, cook the berries, please. Boil those bright red berries, please. Add some lemon--just a squeeze. Please wasn’t the word to use. It’s just weird to beg someone to cook berries. At times the phrasing made the kid sound demanding. Just like Grandma taught you how. Top with butter from our cow. The rhyme with the uncle wasn’t pleasant either. ‘Uncle, swing the cider jug. Swing that gallon cider jug. Pour a drink in every mug. Swing isn’t the right word to imply he’s pouring it. It sounds like he’s going around swinging the cider jug. There’s even a baby thrown into the mix. Not even the baby is excempt from this boy’s demands. He asks the baby to be a sleeping mouse. The boy finally pitches in, but it’s to make paper pilgrim hats as placemats. There were a couple scenes with the boy appearing to wash dishes and another time he was stirring something, but other than that and making paper hats, he just told everyone else what to do. He would be getting on my nerves if I was them. It ended with everyone sitting down at the table, saying ‘We will share the risen bread. It was a nice note to end on. The tone made me read in this sing-songy voice, annoying voice, and it didn’t help things out. It just made the whole thing annoying, but that’s how the book read to me. The writing ruined this for me. Without the repetition, it could have been good. The illustrations were ok. I really liked the way the fire in the coal stove looked, like gold dust. And the herbs hanging on the wall were cute. Delightful story, told in rhyme, of a family's preparations (and anticipation of) their Thanksgiving feast. Food and loved ones. We are blessed. What a joy! This book is great and simple, yet it explores how thanksgiving used to be. I loved it. Told in rhyme, this picture book is a celebration of a family preparing Thanksgiving dinner together. The nineteenth century American traditions echo our modern ones closely. Readers will see the turkey go into the wood-burning oven. Dough for the bread is kneaded and allowed to rise. There is cranberry sauce made on the stove and a pumpkin pie with hand-whipped topping. Mashed potatoes are added to the feast as well as a jug of cider. Soon everyone is gathered around the table and prayers are s Told in rhyme, this picture book is a celebration of a family preparing Thanksgiving dinner together. The nineteenth century American traditions echo our modern ones closely. Readers will see the turkey go into the wood-burning oven. Dough for the bread is kneaded and allowed to rise. There is cranberry sauce made on the stove and a pumpkin pie with hand-whipped topping. Mashed potatoes are added to the feast as well as a jug of cider. Soon everyone is gathered around the table and prayers are said together. It’s an American Thanksgiving done in true traditional style. The rhyming stanzas evoke a feeling of a jaunty folksong as they tell the story of a family making their Thanksgiving dinner. The rhymes create a great rhythm to the book, that will have toes tapping if they are read with enough snap and vigor. The rhyme and rhythm combine to create a strong framework for the book, one where there is a building anticipation for the meal and for the family to all arrive. There are extended family present, including adult siblings, aunt, uncle and grandparents. Throughout, there is lots of work to be done but it is all done in good cheer and everyone lends a hand. McElmurry’s illustrations have a folkart quality to them that works well. Done in paint, the illustrations are simple and warm, inviting you back in time to share a meal that is familiar to everyone. There are lots of period details in the images such as water pumps, dried herbs in bunches on the wall, a wash tub, and large cast iron pots and pans. I have a lot of bias towards holiday books, because I have always loved them so much. But this story did a really great job talking about the history behind Thanksgiving in a fictional way. It is deemed a historical fiction book because although a lot of the story could have happened because the historical facts are accurate, the story itself is not. I chose this book out of the many options at the library on historical fiction, because it was about Thanksgiving and that time of the year is comi I have a lot of bias towards holiday books, because I have always loved them so much. But this story did a really great job talking about the history behind Thanksgiving in a fictional way. It is deemed a historical fiction book because although a lot of the story could have happened because the historical facts are accurate, the story itself is not. I chose this book out of the many options at the library on historical fiction, because it was about Thanksgiving and that time of the year is coming up. This book really got me into the mood to go home and see my family and eat lots of food! Rhyming text that carries you along, repetitive rhythm that helps young readers predict what will come next, and warm family scenes in each illustration make this book a winner. Whether it is read over and over at home for the holidays, or used as a read-aloud in class or library story time, readers of all ages will enjoy the sight of an extended family making their holiday meal preparations. As an educator, I especially like the short summary every few pages featuring all the verbs used in the Rhyming text that carries you along, repetitive rhythm that helps young readers predict what will come next, and warm family scenes in each illustration make this book a winner. Whether it is read over and over at home for the holidays, or used as a read-aloud in class or library story time, readers of all ages will enjoy the sight of an extended family making their holiday meal preparations. As an educator, I especially like the short summary every few pages featuring all the verbs used in the previous rhymes - what a way to call attention to the actions in the story. The illustrations themselves will generate tons of discussion about the wood stove, the hand pump at the sink, and the historical clothing shown. It will also be a good jumping off point for comparing and contrasting what each child is accustomed to seeing at their own Thanksgiving meal. A wonderful read for so many reasons. I highly recommend it! I love the illustrations and rhyming text. I'm not sure about some other key details. Is the family presented with consistent historical details? If you had that stove, is this they style of dress you would wear? Would your aunt have glasses like that? Would grandpa REALLY cook the cranberries? Would an 19th century family really show affection in these sweet ways? I really don't know enough about history to know if they illustrations are accurate; the author and illustrator did not include any I love the illustrations and rhyming text. I'm not sure about some other key details. Is the family presented with consistent historical details? If you had that stove, is this they style of dress you would wear? Would your aunt have glasses like that? Would grandpa REALLY cook the cranberries? Would an 19th century family really show affection in these sweet ways? I really don't know enough about history to know if they illustrations are accurate; the author and illustrator did not include any notes or historical information. My feeling is that this is a sweet and lovely book that doesn't explore the idea of Thanksgiving beyond having a great meal as a family. And while that makes for a lovely story, it leaves a gap in telling a complete and meaningful story about what Thanksgiving is. 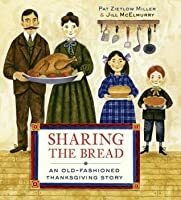 Sharing The Bread transports readers back to the 19th century and follows one family as they prepare a magnificent and yummy Thanksgiving meal! Told through sparse, lyrical rhymes, Sharing The Bread is a heartwarming and charming picture book. The simple, yet descriptive, rhymes are sweet and amusing in their sing-song flow. Little readers will easily be able to memorize their favorite lines and “read along”. From putting the turkey into the oven to making all the fixings and setting a gorgeous t Sharing The Bread transports readers back to the 19th century and follows one family as they prepare a magnificent and yummy Thanksgiving meal! Told through sparse, lyrical rhymes, Sharing The Bread is a heartwarming and charming picture book. The simple, yet descriptive, rhymes are sweet and amusing in their sing-song flow. Little readers will easily be able to memorize their favorite lines and “read along”. From putting the turkey into the oven to making all the fixings and setting a gorgeous table, Sharing The Bread explores it all, and it does so with a lot of heart! The bright, captivating illustrations wonderfully capture the story and will engage little eyes, as young readers have fun pointing out all the clever details. A family prepares and gathers for a Thanksgiving meal. This is one of the first picturebooks with a rhyme scheme that is so exacting and precise that its poetry was a balm. The illustrations depict the the narrative and rarely extent or add further development to the plot. The illustrations are artfully rendered but I cannot help but think how this "old-fashioned" tale feels just so with such a white-washed heteronormative family depicted. There are so many holiday books that feel just like this. A family prepares and gathers for a Thanksgiving meal. The illustrations depict the the narrative and rarely extent or add further development to the plot. The illustrations are artfully rendered but I cannot help but think how this "old-fashioned" tale feels just so with such a white-washed heteronormative family depicted. There are so many holiday books that feel just like this. While it is celebrating Thanksgiving and love, it doesn't offer anything unique to the cadre of holiday stories. The rhyming text for this charming Thanksgiving story is rich and tightly metered. It's use of periodic shifts in pattern keep readers engaged and signal transitions in the story. It has just the right blend of formality and charm to suit the era portrayed and will wear well through the repeated readings that are bound to occur. Kids will be chiming in before you know it. Time spent exploring the illustrations will reveal rich details as well as subtle relationships and many clues as tto the time The rhyming text for this charming Thanksgiving story is rich and tightly metered. It's use of periodic shifts in pattern keep readers engaged and signal transitions in the story. It has just the right blend of formality and charm to suit the era portrayed and will wear well through the repeated readings that are bound to occur. Kids will be chiming in before you know it. Time spent exploring the illustrations will reveal rich details as well as subtle relationships and many clues as tto the time period reflected. I can imagine manny classroom activities, including compare/contrast with personal experiences and modern day life. Stepping back in time Sharing The Bread: An Old-Fashioned Thanksgiving Story (Schwartz & Wade Books, September 22, 2015) written by Pat Zietlow Miller with illustrations by Jill McElmurry gives readers a look at a family preparing a holiday meal. Like integral parts on a well-balanced machine fused together with love, they work together. We begin with Mama. Uncle, swing the cider jug. A thanksgiving story about making dinner for the family. Everyone has their own part to bring the meal together. The illustrations are historical and warm. The text is set up in verses and fun to read. For storytime, I added ASL signs for the members in the family as well as the title of the book. As we read the story, on a family group page, we counted all the family members. Such a wonderful Thanksgiving story to share! This is a cute rhyming story about Thanksgiving, but honestly there wasn't much substance to it. The inside jacket flap claims it's about a "19th century Thanksgiving" but there's no reference to that within the story, nor is there an author's note with possibilities about how to compare and contrast the differences in traditions. I'll keep this one as a nice Thanksgiving story, but not much there to use in the classroom. The spare, rhyming prose fairly sings, and brought back many happy memories of standing around my grandma's stainless steel bucket with siblings breaking the homemade bread into bite-sized pieces for the stuffing. Thank you for the beautiful words, and the picture at the end of the family holding hands, which has special meaning in our family--mountains, valleys, hooray! Pat started out as a newspaper reporter and wrote about everything from dartball and deer-hunting to diets and decoupage. Then, she joined an insurance company and edited its newsletter and magazine. Now, she writes insurance information by day and children’s books by night. She has eight picture books available and nine more that will be coming out in the next few years. Her books in print are: SOPHIE’S SQUASH, WHEREVER YOU GO, SHARING THE BREAD, THE QUICKEST KID IN CLARKSVILLE, SOPHIE'S SQUASH GO TO SCHOOL, WIDE-AWAKE BEAR, LORETTA'S GIFT and BE KIND. Pat has one wonderful husband, two delightful daughters and two pampered cats. She doesn’t watch much TV, but she does love "Chopped." Pat lives in Madison, Wisconsin.